To edit a project, go to the Projects page with the left-side menu on the Toggl web app. Once you are there you can use filters to locate the project you need. To save all your edits you need to make sure to click the green "Done" button on the upper-right part of your screen. To bulk edit projects go to the Projects page using the Toggl web app and either tick the main checkbox at the top of the list of projects to select every project on the page (up to 50 per page) or select multiple projects by ticking the boxes on the left side of each project. Once you select the project you'd like to bulk edit use the drop-down menu next to the main check-box at the top and select the "Bulk edit" option. 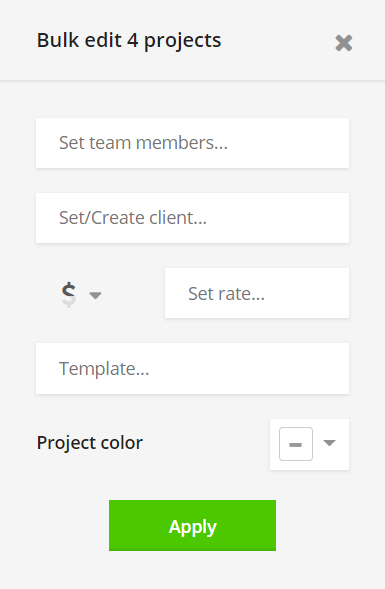 After clicking on "Bulk edit" an overlay will appear allowing you to bulk edit team members, client (an existing one or create a new one), currency and rate for billable projects, apply a template and change the color. Once you are done with your selection click on the green "Apply" button to apply the edits in bulk. The edits you choose to apply will be applied to all projects in bulk and override previous values for the elements you chose to edit. Archiving projects is a better way of clearing up your workspace of existing projects you no longer use than deleting them. An archived project can be restored at any time should you need to do restore it. To archive a project locate it on the "Projects" page, click on the project you'd like to archive, this will open up its edit page and use the cogwheel icon on the top-right corner of the page to access the "Archive" option. Once you locate the project you'd like to delete on the "Projects" page click on it to access its Edit Page. Once there, click on the cogwheel icon on the top-right corner of that page to find the "Delete" option. Clicking "Delete" will instantly delete the project without asking for a confirmation. A small popup will appear at the bottom of your screen briefly allowing you to "undo" the action. Important note. Deleting a project will not delete the data (time entries) associated with that project. However, deleting the project will make the related time entries project-less. To bulk delete projects go to the Projects page and either tick the main checkbox at the top of the list of projects to select every project on the page (up to 50 per page) or select multiple projects by ticking the boxes on the left side of each project. Deleting projects will result in all time entries previously allocated to those projects will not be without projects. They will be categorized and most likely impossible to find using filters in reports. Before deleting, especially in bulk, we advise you to export a detailed report into a CSV file so that you can backup your data and are able to import it back into your workspace should you make a mistake.